Within trio of executive moves in a bid to accelerate key global partnerships and capabilities, the current CEO of Embraer Commercial Aviation and executive vice president of Embraer S.A, John Slattery, has been appointed as president and CEO for the commercial and aviation services joint venture between Boeing and Embraer. The appointment is subject to formal appointment by the joint venture's Board of Directors after closing. Once approved, Slattery will report to B. Marc Allen as the chair of the new company's board of directors. Slattery will be based in Sao Jose dos Campos, Brazil. The new overhead bin solution is part of an ongoing product development effort by GAL Aerospace to improve the customer experience and extend the service life of Q400 aircraft fitted with classic interiors by providing a plug and play replacement for the original, undersized bins. Insufficient overhead bin space poses a major challenge to on-time departures, frustrates passengers and cabin crew, and causes airlines to employ inconvenient and expensive gate check or plane side service to mitigate the problem. GAL’s replacement overhead bin solution is specifically designed to accommodate standard roll-aboard bags, thereby eliminating the need for gate check service, and greatly improving the passengers’ overall travel experience. Capital. With our design now fully certified by the Canadian, American, and European authorities, we are very excited to move forward in support of regional aircraft customers,” said Jonathan Cornwell, Vice President of Business Development and Sales for GAL. SR Technics has signed a Letter of Intent with the objective to assist Mega Aero Training Academy (MATA) in the development of a fully EASA Part-147 approved training academy in Johannesburg, South Africa. The 5-year partnership of SR Technics Training Services and MATA will bring to South Africa a recognized engineering training expertise, such as but not limited to EASA Basic Training, Type Training, Specialized Training and Web Based Training. Japan’s All Nippon Airways (ANA) has taken delivery of its first A380, becoming the 15th operator of the world’s largest passenger aircraft. layout seating 383 passengers, including 60 couch seats. The aircraft features ANA’s very latest in-flight entertainment systems, as well as full connectivity in all classes. 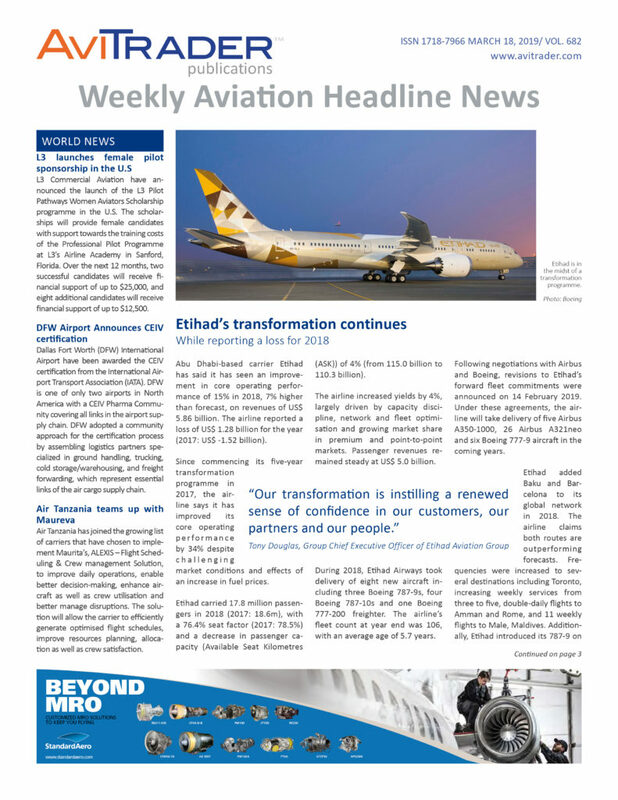 Etihad Airways and Gulf Air have signed a codeshare partnership, for travel commencing with the summer schedule. The announcement follows the signing of a Memorandum of Understanding (MOU) between the two carriers at the Bahrain International Airshow in November last year and will further strengthen the strong ties between the two countries and carriers. AJW Group has appointed Nigel Woodall as Group Sales Director. A trained and licenced aircraft engineer, Woodall has 40 years of management experience in the aviation industry. Most recently, Woodall held the position of Senior Vice President Customer Support at Meggitt. In this role he was responsible for leading the business’ aftermarket support function. In his new role, which commenced on March 18, Woodall will be responsible for driving sales across AJW Group globally. Woodall will report to Chief Sales Officer of AJW Group, Tom De Geytere. 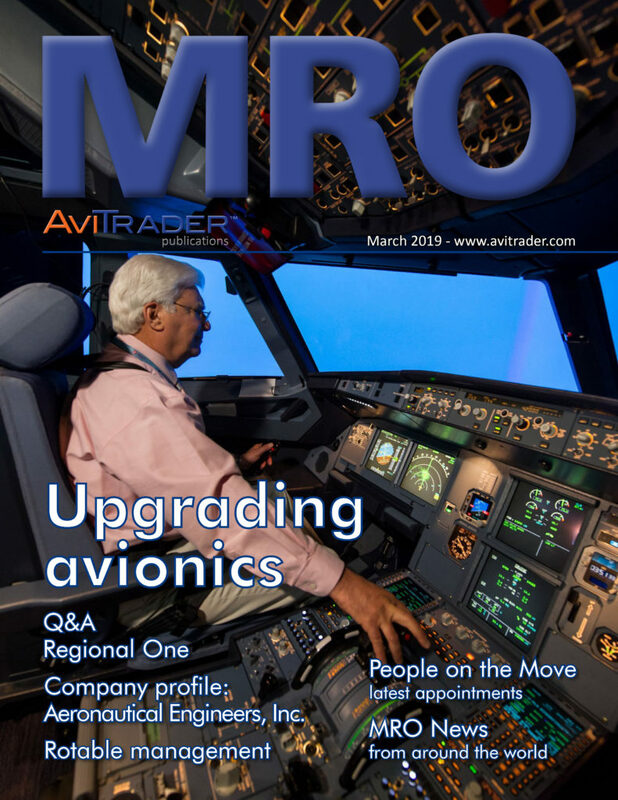 He will be based at AJW Group’s Headquarters in Slinfold, West Sussex, with regular travel to the business’ MRO in Montréal and other global offices. Aerospace and British Airways, among others. Munich Airport has reported a successful 2018 operating year at its annual press conference in Munich. The 3.8% increase in traffic to a total of 46.3 million passengers flying to and from Munich, and the resulting gains in aviation and non-aviation revenues had a decisive impact on the increase in Group sales, which – based on preliminary figures – topped the €1.5 billion mark for the first time. EBITDA also surged to a new all-time high of €535 million. The airport operating company – the FMG Group – finished off the past year with earnings after taxes (EAT) of €150 million. Cash flow from operations improved by €80 million to €465 million. With equity of over €2.2 billion, the equity ratio, at 41.3%, exceeded 40% for the first time. contributing to the renewal of the long-haul fleet in Munich was the Airbus A350. By July of this year, Lufthansa will have 15 of these fuel-saving and extremely quiet widebody jets stationed in Munich. The strong demand in the intercontinental segment contributed to yet another increase in the average aircraft load factor at the Bavarian hub: With an average of 77.5% of all seats filled on arriving and departing flights, the airport achieved the highest quota in its history. The service will commence from June 2019 in line with the delivery of the first of 31 A350XWBs (18 A350-900s and 13 A350-1000s plus options for a further 25 aircraft) on order with the airline. First service planned for the new aircraft will be in September 2019 on the Tokyo Haneda-Fukuoka route. The service to be provided by Satair will be covering all airframe expendables for the aircraft and will be provided through an on-site stock to JAL. The service includes planning, sourcing, purchasing, logistics and inventory management. SR Technics has been selected by United States-based low-cost airline Allegiant Air to service its fleet of CFM56-5B engines for a period of three years. Headquartered in Las Vegas, Allegiant Air is the ninth largest commercial airline in the USA. It currently has a fleet of 80 Airbus A319/A320 but expects to be flying 93 aircraft by the end of 2019. Joramco has obtained FAA approval for the A320neo after adding this capability to the EASA approval in February 2019. Amman-based Joramco, the engineering arm of Dubai Aerospace Enterprise (DAE), has built a sound track record as a leading commercial aircraft maintenance, repair and overhaul (MRO) facility serving a wide range of customers in the; Middle East, Europe, South Asia, Africa, Russia and the CIS countries, offering services on several aircraft models from the Airbus, Boeing, and Embraer fleets. Strategically located at a free zone area in Queen Alia International Airport in Amman-Jordan, Joramco’s facility includes 5 hangars that can accommodate up to 15 aircraft.